&Pgr;01 classes in mathematics (D. Cenzer, J.B. Remmel). Computability theory and linear orderings (R.G. Downey). Computable algebras and closure systems: coding properties (R.G. Downey, J.B. Remmel). A survey of recursive combinatorics (W. Gasarch). Constructive abelian groups (N.G. Khisamiev). Recursive and on-line graph coloring (H.A. Kierstead). Polynominal-time computability in analysis (K. Ko). Generally constructive Boolean algebras (S.P. Odintsov). 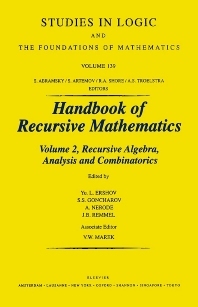 Reverse algebra (S.G. Simpson, J. Rao).